The Diamondbacks improved to 3-0 today. I recorded my first strikeout of the year, then my second...at the plate, unfortunately. However, I had an RBI single later, and saved a run with a diving catch at short. Which is all well and good, until you have to dust yourself off. Miss Bee can't understand why I picked such a dirt-filled game - she thinks I would have liked swimming, since it's just one big bath! The Salsa Challenge is an annual event in Tempe, at the Beach Park by the lake. This was my first challenge. Lots of people at the challenge - also a protest at A Mountain when we were leaving. The literature for the event stated that over 20,000 people were going to attend. I don't know about all that, but there was a good crowd. The building is an old school, painted and decorated for kids. Everything is really hands-on. It's a great field trip for young kids; I don't think I would take a 3rd grade class, but Pre-K to 2nd is good. This one's not mine, but what a great picture. Some of our group in front of tubes that blow air really fast. When you put a ball or a handkerchief in they go sailing around and flying out a hole at the other end. A six year old in size sixteens. The art studio has this house that has been painted two million times. Turned out badly, but this student said, "Look, you can see the whole wide world from here!" I finally got some Tom's Shoes last night - I'm very excited about them. For each pair you buy, one pair is given away. Check out their Our Movement page. Unfortunately I can't find a picture online that shows them. This is a generic picture of Tom's. They're not in the Toms online store, and the fabric is made by Livity Eco-Textiles, which I can't find that much information about online. The upshot is that the shoes are made of 61% hemp (benefits: one of the strongest natural fibers, grown with no pesticides, naturally anti-microbial) and 39% recycled plastic bottles. Pretty cool! Also, I'm strongly considering the tan-and-white rope-sole Tom's for the wedding to match the Indigo linen suit I got at J. Crew. 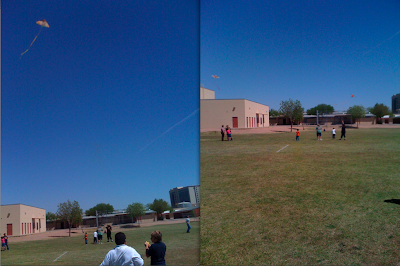 Herein two poor cell phone pictures of our kite flying are spliced together into one poor meta-cell phone picture. This past week my class celebrated Winds-Day. Festivities included hanging flypaper and observing our catch, learning about the cause of wind, reading wind books together, folding paper airplanes and flying them with and against the wind, and flying kites. It was very windy, so that was nice. Our flypaper catch was a little less exciting than our predictions, mostly sand and bugs. The result of our statistical analysis came to the shocking conclusion that we can throw paper airplanes farther with the wind at our back. And the kites were fun - fortunately there are no pictures of me sprinting through campus after a runaway Toy Story kite..
On the iPhone. It's amazing - if you say it's a waste of time, you're calling my entire time in elementary "Computer Class" a waste of time. Well, except for Number Munchers. Over an hour of game play and we're not even halfway there. 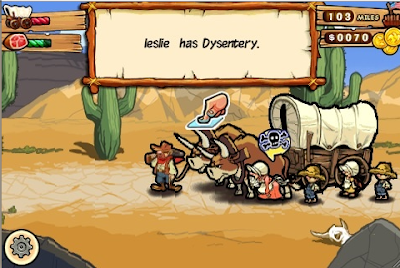 This is not your parent's Oregon Trail. We got our new tiffin carriers in the mail. The jury is still out, but I like them at least as a novelty. 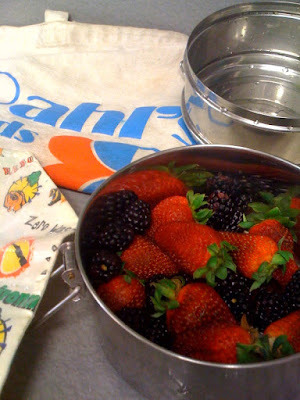 The fruit is in the lower container; the one in back goes on top, and a lid secures the two together. Cameo appearance by the Dahl's bag. Thanks Mom!